Give the Maya water power ! Clean running water is something we in Europe all take for granted: but the Maya people of Guatemala do not have this luxury. Abandoned by the government, the native population of this beautiful country has very poor access to this fundamental necessity of life. Maya women spend up to six hours a day fetching and carrying water that is invariably dirty and polluted.This has to stop. In the province of Alta Verapaz, the poorest region in Guatemala, the Dutch foundation Ayuda Maya provides entire villages with clean drinking water by helping them to build an ingenious supply system. Once they have the power of water, we see these villages develop themselves and blossom in all senses of the word. Help us by supporting our projects to give Maya people a better quality of life. 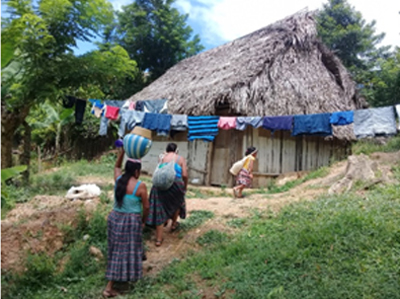 Each year the Ayuda Maya Foundation works with the local not-for-profit organisation Adicay, to supply one entire village with a gravity-fed water system. A tap outside each home brings not only clean drinking water to every villager, but many other benefits too. With ready access to clean, running water, general health improves and death rates decline, particularly in children under five. To further support clean living, we also install latrines and provide information about hygiene and cleanliness. Once installed the running water can also irrigate newly-created vegetable gardens. The vegetables not only feed the family that grows them, but also provide a surplus to sell at market. With clean water and fresh vegetables, children are suffering far less illness which means precious funds are no longer required to buy medicine and medical services. So bringing running water to the Maya also provides them with a small income. We do not begrudge them this. Would you? During the installation of each new water supply system, the Ayuda Maya Foundation works from start to finish with Adicay, a local engineering company led by a Maya woman, Ana Cal Choc. All the professionals involved in the projects speak the local language and know the culture of the people they are working with: this helps to open doors and get things done. In a country where there is much corruption, Adicay is a trustworthy, not-for-profit organisation. We ensure that each donation, whether large or small, goes directly to provide water for each and every villager. The villagers are closely involved in the installation of the water supply systems. They help with digging channels and transporting building materials. In this way they learn how the system works and assume ownership of it. This both encourages and enables them to maintain the system over time. It becomes every villager’s responsibility. It requires between 40000 and 60000 euros (depending on the village size) and six months to install one village’s clean water supply. Getting drinking water within six months represents an evolutionary leap of some sixty years in a village’s development. The next village is ready to start work as soon as funds become available. With your help we can bring another deserving village clean, running water and a much improved life.